A friend of mine is starting his first GURPS Fantasy campaign (150 pt characters 35 disads 5 quirks). One of his friends wants to be a monk character like from Avatar the anime cartoon. This monk has powers relating to his connection to the earth. Being new to GURPS my friend asked me for help. The players wants, martial arts, a foot stomp, stone armor, and the ability to damage with stones. So I made a GURPS Dungeon Fantasy Monk characters. Cut out all the chi powers except for Chi Talent, and reduced his stats to ST 10, DX 14, IQ 10, HT 11. The character still has some of the cinematic martial arts skill effected by Chi like Power Blow, Immovable stance, etc. In place of chi powers I made the following. Modified from templates I found in the GURPS Advantage PDF that was created on SJ Games GURPS forum. I added the Power Modification:Chi from Dungeon Fantasy I to all these powers. For all this I noted how many character points per dice or point the player needs to spend to boost them with XP. You do an all-out attack to stomp on the ground. When your chi connects to the earth a powerful shock emanates from your feet, knocking every person within 2 yards back. Doesn't do any other damage. Note: I replaced the original Explosion Enhancement with a 2 yd Area of Effect to keep the adjudication simple for my friend. You can connect your chi to the earth to transform your hands into fist of stones. There is a price in that you lose the ability to manipulated find objects (gain Ham-Fisted disad) but you now can parry weapons or be parried by weapons without taking damage yourself. Note: Pretty much as is from GURPS Advantages except that the use of Chi Limitation means only 4 seconds instead of 8 seconds is needed. Connecting your Chi to the earth draws up dozens of small pebbles and stones to form a second stony armorlike skin around your body. However it is only temporary and is chipped away by weapon attacks. It takes one hour to regenerate the stone skin after it is gone. It takes a ready action to activate. Note: This was taken from one of the science fiction oriented portable shield generators. Instead of a "capacitor" it now requires one hour of "Meditation" and then a number of minutes equal the max DR to regenerate. I suspect at 1 pt per DR the player is going to be putting points into this. Reflections on a lot of dead orcs. The whole thing started because of a random encounter. While I knew was in the region I had no clue that in a Orc hunt was in the works until it occurred. Luckily it happened late in the session so I had some time to prepare. Otherwise I would have winged at least an orc outpost and then prepare something more elaborate later. A lot of my campaigns have moments like this and it is what I feel the essence of running a fantasy sandbox. Another I will point is that I have no problem with high level parties going up against low level opposition. When you run sandbox campaigns that can and will happen. Of course there are always consequences even if they manage to spectacularly slaughter hundreds as they did in this adventure. And those consequences led to... yup even more adventures. Perhaps against a more experienced foe or perhaps not. 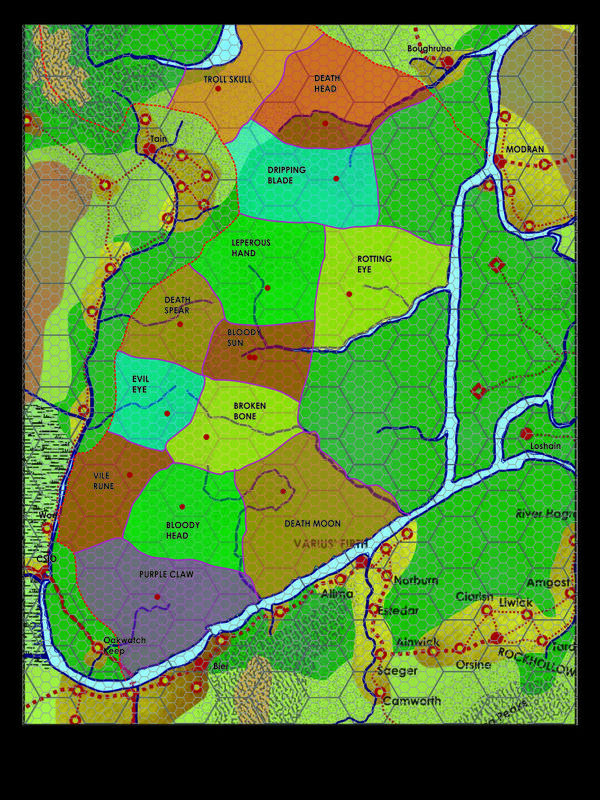 I been working on a master map of the Majestic Wilderlands for a while so I just exported what I had done and overlaid the information from this map on it. 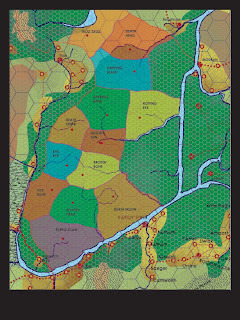 I plan to use this at some point to use this as the basis for something I call a mega-wilderness. Players been having a go at the Orcs of Deathwoods since my campaigns of the early 80s. Somehow the orcs always managed to bounce back. The use of Battlesystem went well. As it turned out it was good that brought it as I had to use the counter for large rooms in the orc warrens with each counter representing four orcs. Basically the way Battlesystem work is that you look at the target's AC, the attackers THACO, subtract one from the other which produces a modifier. A higher modifier is worse. Then you roll 2d6, add the modifier and look it up on the Battlesystem chart. This produces the number of hit dice of damage. Battlesystem abstracts damage and hit points into Hit Dice. So an Orc has 1 HD, a Ogre has 4 HD and so on. They reached back to Chainmail for the inspiration on this. Then you shift to a higher dice column if you have a damage bonus. So a unit doing 1d8+2 would start with the d8 column and shift over to the d10 column and then the d12 column. Multiple attacks each look up their damage separately and are added together. For heroes each HD of damage inflicted on them does 4 hp. As pointed out earlier the system is built when there is 10 individuals per figure. When you have 5:1 or individual a +modifiers is added on top of everything else. For individuals this is +15. So I figured out the math for Ascending AC and using To Hit Modifier instead of THACO. It worked well in play but I had to write down a table of everybody AC and modifiers to make it go quickly. It wasn't enough to just have the stats on cards. The battles are not as challenging as they could have been. In the first one advancing in close order was a big mistake against the fireball the parties possessed. The orcs quickly suffered morale checks, failed, and ran. The second was better as the orcs advanced in skirmish formation and the battle went as well as I hoped. The party had their backs on the wall and were bloodied but they managed to execute a plan that saved the day for them. I have to save for the OD&D fighter, mass combat is where they shine. Now the group had a lot of fireball runes (think scrolls) so it wasn't readily apparent. But on reflection the fighters were the ones really pumping out the damage. Especially against the one HD creatures. I think a lot of the complaints about fighters vs magic-users would disappear if mass combat was used more. The Orc Wizard really made a difference as well. In any setting using DnD mechanic having heroes is critical. Heroes will need some forces but there are cases, this this one, where a group of only heroes is enough to turn back the orcs. Two other things I overlooked. The Orc wizard's magic items, just plumb forgot to use them. Although after the attack of the knight and the fire elemental probably wouldn't not have made any difference. Then I forgot to add Warg Riders. The big impact of having them is that they are not considered 1HD creatures as the mount and rider combine to produce the final stat card. Timewise both battles did not much longer than a regular OD&D combat which was a pleasant surprise. With experience it would probably take just as long. One time saver is that you treat each unit (with 4 to 15 figures) as a single entity.. Speaking of unit cards you can download the ones I made from here. Now that I have run Battlesystem I am really impressed with it. At its heart it uses a Binomial distribution chart to quickly resolve d20 combat. This means it can be applied to ANY edition edition of DnD. Something I intend to try with the Dungeon Crawl Classics RPG. The player complaints was the switch to 2d6 low, and the fact we were using counters. Unfortunately any method to use a d20 roll high would be cumbersome. And any simple method would not be accurate or fair. Binominal distribution allows to calculate the odds of success over many trials (i.e. rolls) . The result is a bell curve which means multiple dice need to be roll. 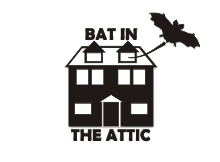 Battlesystem elected to use 2d6. I hope you find this informative and give 1st edition Battlesystem a try. Recently at Gold Star Anime the party prevented a war between a duke of City-State and the Dwarves of Thunderhold. Battered but victorious they returned to City-State to rest, recuperate and raise a dead member of their party. One of the highlights of their stay was stopping at the Sorceror Supply House and browsing through the magic items. The barbarian in the group was determined to make sure his sword was properly guarded while being enchanted and stood outside of the magic shop all night. While wandering the city they encountered a cleric of Thor organizing a party to hunt orcs in the Forest of Dearthwood just to the east of City-State. Intrigued the party decided to go along. Or rather one of the party liked the idea and it snowballed until the entire party decided to go. For the next session I prepared some notes on Dearthwood and the party was gun-ho to enter the orc infested forest. Since the group's average level is around 7th level or so I knew they would deal a severe blow to one or more orc tribes. 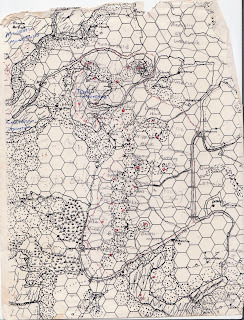 So for the first time in 25 years, I read up on 1st Edition ADnD's Battle System. Along with that I prepared a small orc outpost and a main tribal cave complex. Playtesting Battlesystem I found that it works perfectly fine with Swords and Wizardry. All was needed was some changes in the formulas to handle Ascending AC and the To Hit Bonus system. The party went northeast into the territory of the Vile Rune Orcs. Two days in they were ambushed by an Orc raiding party and easily wiped them out. The party found two sets of multiple tracks and elected to follow the one with a smaller number of orcs. That lead them to an outpost which they promptly wiped out. However there were some tense moments on an unexplored lower level when they ran into a level draining wraith. Also they found that the caves were once a hideout of a rouge Thothian mage before the orcs took it over. Afterward they followed the larger set of tracks through the forest to the Vile Rune main underground warren. They carefully took out some sentry and got inside without rousing the the alarm. Prowling the network of caves they found the main hall of the Vile Rune King and slaughtered the monarch and his court. Thus ended the first session. Two weeks later we picked it up there and the party quickly found the main hall of the warren a massive cave 170 feet in length and nearly 120 feet wide. Each miniature is an obvious better equipped high status orc and the counters represent 4 orcs each. There was nearly two hundred of orc warrior, women, and children in this cave. Well the party made short work of them with liberal use of fireball spells and scrolls. Disappointed in the treasure the party started milling around and talking among themselves. A few wise party kept an eye out and were able to snip off some scouts sent in from the rest of the complex. It quickly became obvious that the alarm was raised. From the western entrance (left edge of the photo) a thundering noise was felt and heard. A herd of cattle and pigs swarmed into the cavern! Behind them were a half dozen warg riders chargining into the party. But even this valiant effort by the orcs came to naught as the high level fighters and magic users quickly killed them. The Cleric of Silvanus used her knowledge of the natural world to calm the pigs and cattle. The only one that was seriously hurt was the human knight who rolled a 22 and severed the head of one of the cow as it passed by. Unfortunately this meant the cows following got tripped and slammed into the knight. He failed his saving throw and took some damage from the two cows plowing into him. The Orcs then tried to smoke party out by building burning pyres at each of the entranceways. But an Ice Storm took care of one and the party charged outwards to continue the slaughter of orcs. \By this time the survivors had enough and fled the warrens. The only casualties was the Cleric of Thor and his Viking henchmen who left to guard the entrance of the warren. One thing the party noticed when they finally got back outside was the silence. Throughout their journey there was the constant sound of drums as one tribe challenged another. As the party prepared to leave they started heard the challenges from the surrounding tribes go unanswered. Realizing that they may have company they quickly started returning to City-State. 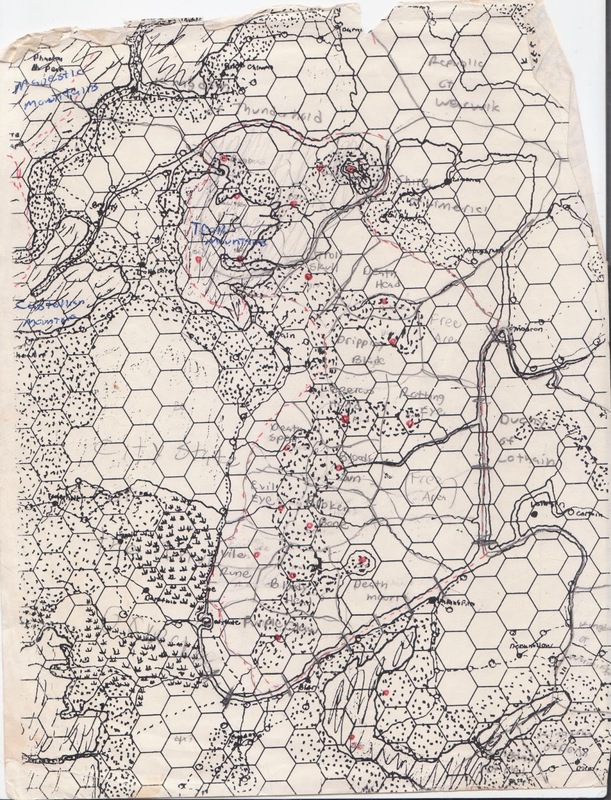 Several hours later the party spots an large number of orcs heading in their direction. They founded a defensible hill by a river and waited. Each counter represents 10 orcs and 1" = 10 yards. The squares on the table are one inch each. Nearly 500 orcs from the Purple Claws headed to the ford. However due to foolishly advancing in close order the magic-users quickly blasted them with fireball runes and the orcs broke and ran. The party chased down a few stragglers and killed them. The next day the party continued on to City-State but were slowed down by the mud and rain. (Randomly rolled from the Harn weather chart). Around noon another large force of orcs was sighted this time from the Bloody Heads. Party fled to another head but didn't have the time to choose as good of a defensive position. 650 orcs from the Bloody Heads advanced on the party. Having come across the blasted remenants of the Purple Claws they elected to advance in Skirmish formation. Also with the orcs was a party of 20 ogres and trolls. While yet more fireball runes were let use this time it only barely slowed them. As the tide of orcs swept up the hill they revealed their trump card. Paltak one of the few orcs to have mastered magic. A full wizard (9th level) he let loose with a fireball of his own on the party. Three members of the party fell to the ground! Recognizing the danger and heedless of his inexperience (4th level) the human knight charges through the open ranks of the orcs and engages the orc wizard in one on one combat. He was able to strike the first blow and nearly cleaved the orc wizard in two but a Cone of Cold felled the brave knight. However his sacrifice was not in vain as it bought time and allowed the Dwarven Runecaster to activate one of his most precious of runes and summon a Fire Elemental! With the Orc Wizard engaged and finally felled by the elemental, the tide of battle slowly turned in favor of the party. The fighters truly came into their own. Their multiple attacks on 1 HD creatures resulted in the slaughter of whole ranks of orcs. Even as the orcs flowed around the party's right flank the tide was starting to ebb as they lost heart. Only the 150 orcs of the wizard's guard managed to leave the field in good order. With the rain continuing and more drums in the distance the party immediately picked up their fallen comrades and a few hours later managed to make it back to City-State before nightfall. My next post will talk about how well the system worked and feedback I got. Michael Tumey of the Gamer Printshop is running a Kickstarter to help get printed a tutorial book about making maps. What impressed me was the range of software being targeted including my favorites Inkscape and CorelDRAW. For my friend Tim of Gothridge Manor there looks to be a section on how to use Xara which I know he has. In short it not their abilities that set the two aparts but the roles they play in their religion. My view of paladins and what they are is heavily influenced by Elisabeth Moon in her Deed of Paksenarrion series. To me this is most gamable summary of a DnD style paladin I ever read and the basis for how I referee them. It is the core of what went into the Majestic Wilderlands supplement not only for Paladins but Myrmidons as well. The Cleric job is work with a specific group, locale, or organization for his religion. Wisdom is required not just for common sense but also the willpower to endure the slow millstone of time that comes along with the job. A paladin will come through, lead the charge to break evil's grasp, and go off on his next quest. Then it become the Cleric's job to pick up the pieces and build something lasting in the name of his god. I didn't get to use Battlesystem on Saturday as the party hasn't finished clearing out the main cavern of the Vile Rune orc tribe. Although they did probably broke their back when they slaughtered the king and his court while they were feasting and betting on a fight between a panther and a bear. Basically the idea behind this is that the less individual a figure represent the less damage they will do. In normal Battlesystem the higher AR lowers your damage. I did run a short playtest to see how it would out. I have to say the fighter types against 1 HD creature just rule as individuals. I manage to have one guy to 50 HD of damage in one Battle System round wiping out five figures of orcs (50 orcs). I know in some editions that only works if they are HD 1-1 or less. In my S&W/Majestic Wilderlands I allow it for HD 1 or less due to the lack of multiple attacks at higher levels. After playing around with the number I found that I need to subtract the above to use this with a To Hit Bonus and Ascending AC. So Sir Mighty a fighter who has +8 to hit will have an AR of -7 in Ascending AC Battlesystem. A group of 4 HD Ogres in Swords & Wizardry have an AR of -1 due to the fact they are setup as figures with a 5:1 to ration. 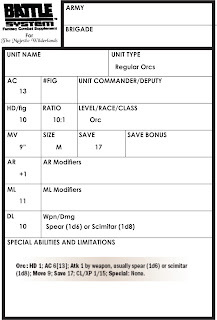 The ogres are +4 to hit - 5 for the 5:1 ration = AR -1. 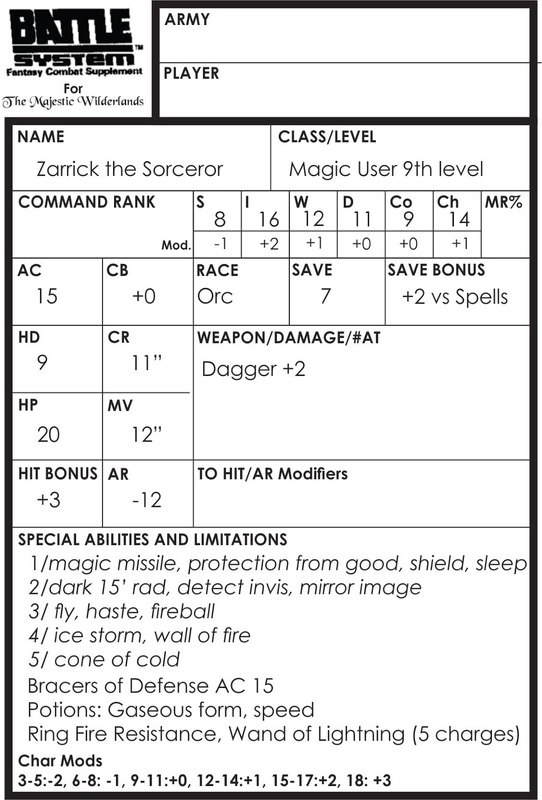 I also did some looking at the DCC RPG and I feel it would work as far as spells goes. It would be a more random compared to D&D due to the spell charts. But however it would probably be more interesting due to the increased variety of results. I will look at the fighters next and see how that would work out. Just in case you want to pick one of the many fine OSR products on Lulu. This is good until August 9th. I always been a fan of 1st edition Battlesystem. Namely because out of all the miniature wargame ruleset for DnD that have been produced I feel it is the one that operates the most seamlessly with ADnD 1st edition. As well as intregrating individual heroes well. There is nothing like seeing the true power of a fireball when you chuck it on a incoming formation of orcs. With makes even more nice that there are notes that tell you how to make it work for plain DnD namely the Mentzer's BECMI line. I am probably going to use it for an upcoming game using Swords & Wizardry and my Majestic Wilderlands. Now the original Battlesystem used THACO and descending AC to calculate how much damage is done each round. So how do I use it with a retro-clone that has Ascending AC and To-Hit bonus? Normally it works like this. 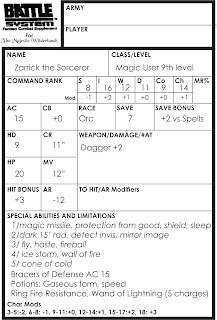 With Swords and Wizardry, d20 or any other retro clone using Ascending AC it would work like this. A THACO of 17 means the character has a +3 to hit bonus as AC 0 in Ascending AC is 20. 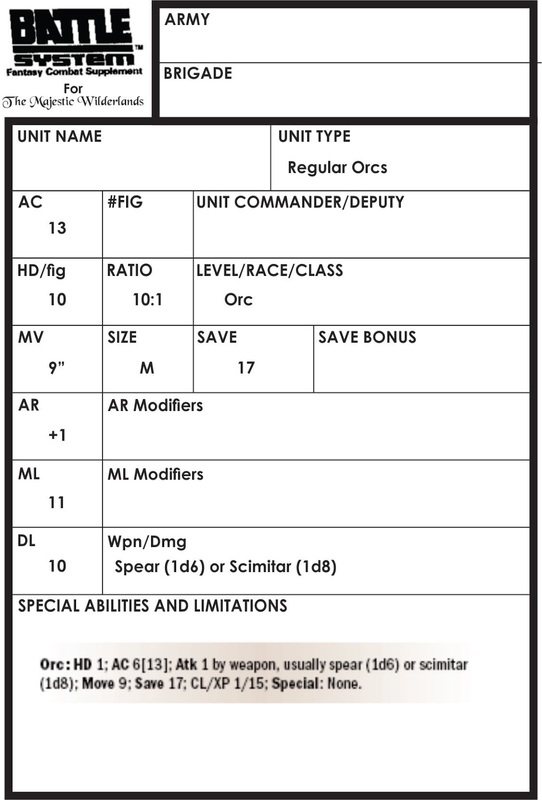 The rest of the Battlesystem rules with dice of damage, modifiers, even the unit stats work pretty much as is with anything from ODnD to 3.5. Tim Shorts of Gothridge Manor just released Manor #4. This issue has two major section, a short adventure and a mini-monster manual that has been illustrated by Jason Sholtis' excellent illustrations. I contributed two monsters myself, the Temple Guardian which include a bonus section on how to create them. And I contributed the Boglings, a frog-like amphibian race. I am not quite sure what to make of Jason's illustration of those guys. You will understand when you see the picture. The print version of the Manor can be purchased from here. It comes with a cool extra that reminiscent of a old TSR Product. The PDF Version can be bought from RPGNow or Lulu.